Pearmund Cellars 2009 Celebration – Breaks the Barrier! Three days back at work and it has been a very long day. I trotted my exhausted bones downstairs to the cellar (storage room) and selected a Pearmund Cellars wine. All I saw was the screw top and the letter “C” and thought, “Great, I’m too tired to operate a corkscrew”. I popped the screw top, made my way upstairs and realized I opened a 2009 Celebration (white wine), not Collaboration (red wine); this is what happens when you select a wine in poor lighting. The Celebration is not as chilled, as I like, so drop in a few frozen grapes, which every wine enthusiast should have on hand (white grapes for white wine and red grapes for red wine). ICE CUBES IN WINE – BIG NO-NO! The color is amazing – brilliant golden butterscotch color with sweet aromas of honeysuckle and cherries; hmmm… I do not think this is a dry white. I sip and flooded with sweetness: big tropical flavors of peaches, pears and hint of pineapple with a citrus finish. The best description is “fruit cocktail” in glass. The residual sugar is not high, around 1 to 1.5 percent. I’m so not in the mood for a semi-sweet wine. What is one to do? I thought about making frozen winesicles or opening another bottle; instead, I drank it and VERY TASTY! Time to check the website for the winemaker’s notes, www.pearmundcellars.com. It appears Pearmund Cellars no longer produces the 2009 Celebration. 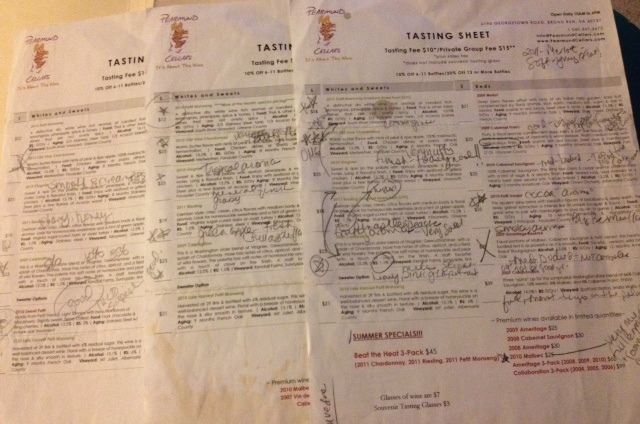 For this reason is why I save my tasting notes and for future comparison. 2009 Celebration is a blend of Viognier, Gewurztraminer and a “splash” of Chardonnay. The grapes are from Kendall Farms in Sunnyside, WA and I was correct, the residual sugar is 1.5 percent. If you can get your hands on a 2009 Celebration you will not be disappointed and it will also make a delicious “White Sangria”. 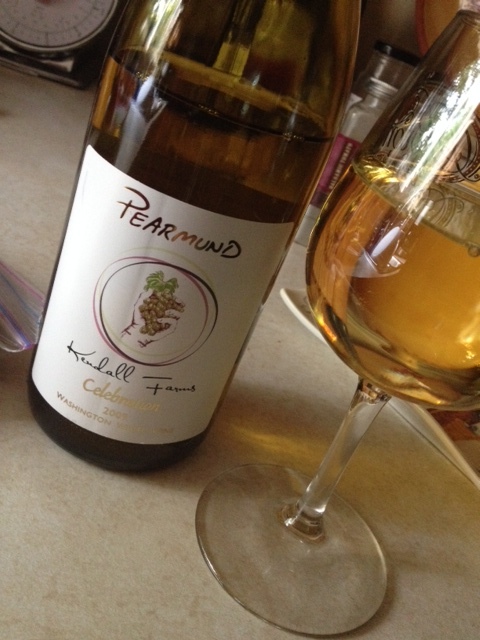 All of Pearmund Cellars wines are great – A MUST VISIT!